Pattern Description Just-off-the-sheep rugged tunic whose high collar, seed stitch front bands, and laced back give it a fashion-forward edge without sacrificing a practical and warm wearability. 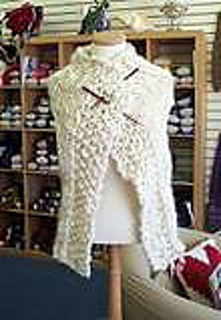 Yarn Information Pattern calls for 8(9,9,10,10) balls of Rowan Biggy Print for bust size 33.5" (36", 38.5", 41", 44"). Needle Information US 17 and US 19 needles, size P crochet hook, tapestry needle. Gauge Information Given gauge is on US 19 needles.